Mahalo CEO Jason Calacanis is trying to make his Twitter account @auto become the account on Twitter with the most followers on the site, that position is currently held by Aston Kutcher (@aplusk). To get people interested in following @auto, Calacanis is offering to giveaway a real Tesla S model to one of his followers if @auto reaches the #1 Twitter spot. 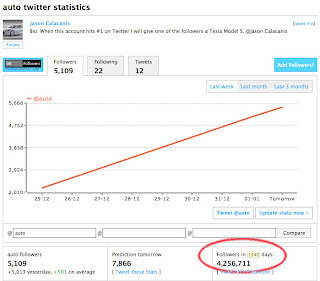 TwitterCounter.com, a site that calculates Twitter follower growth trajectory, predicts it will take over 4 years (1542 days) to reach a number slightly above the current amount of followers held by the current Twitter follow count champion @aplusk. Of course this estimation assumes @auto continues to grow at the same rate it has in the past 6 days from 0 to 5.497 followers. It also assumes that Kutcher or some other account won’t add any more followers above the current 4.2 million Kutcher currently has. Jason Calacanis is an interesting person. He once tried to get Wikipedia to put ads on its site. He also offered Twitter $250,000 to have his @questions Twitter account become a “suggested user” on the site. Jason also had an issue with Apple’s App Store review policy and publicly criticized Apple for their process. Nothing is wrong with any of these past efforts; rather, they illustrate that Calacanis is an interesting person who loves to test the boundaries and status quo of the web. His free car giveaway seems like an attempt at inexpensive buzz, which this blog article is now contributing too. So it is working to some extent. But why bother with all this? Is it just an attempt at some PR for Jason or creating "reach" for the @auto account without any marketing spend or hard work? It's probably a bit of both, plus it's also got to be a fun game watching people get all excited about a free car. Besides the game/contest factor, it really has very little business value. It reminds me of sweepstakes companies run. What you learn is that you get tremendous unqualified response. By unqualified, I mean people who could care less about your brand or products; they simply just want to win something. @auto essentially becomes an account with a bunch of followers whose interest is only free stuff and that is a tough audience to engage with unless you continue to offer free stuff. Beyond that the audience is untargeted and untargeted marketing is very, very low in its effectiveness. I personally have significant doubt Calacanis will ever have to part with a Tesla S. In fact, I’m willing to giveaway a car too if Calacanis is able to obtain the #1 position on Twitter. Now I don’t have a Tesla S to give, but I do have a slightly-used beautiful car I’m willing to giveaway. 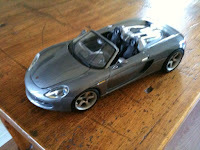 So here is the prize, I’m willing to give one of my Twitter followers a free Porsche GT Carrera remote controlled 1:18 scale model car if @auto becomes the #1 account on Twitter. In the meantime, we can follow @auto, not to win a free car, but to see if anything worthwhile will be done with the @auto account beyond a cheap contest follower grab. UPDATE: Looks like I probably will keep my car as the @auto account is sputtering out in its follower mission to become #1 on Twitter. With 10,383 follows as of 1/6/2010, it will take about 4,600 days to catch up to Ashton's current total or roughly 12 1/2 years. So good luck! UPDATE 1/21/2010: Oh well, it looks like the free car giveaway has sputtered to a halt. There ended up being only 10,730 followers that actually believed they could win a car that has yet to be built. Funny thing is the last Twitter post from @auto is this one about how well the contest is going that Jason Calacanis felt he would start a new contest for a free Nexus One cellphone.